Esteban Edward Torres (born January 27, 1930) is an American politician. He is a member of the Democratic Party. He was born in Miami, Arizona. 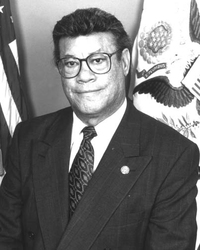 He served as a member of the United States House of Representatives from California's 34th congressional district. He served as a member of the California Transportation Commission from 1997 to 2007. This page was last changed on 10 May 2017, at 21:45.